Our philosophy of marketing is based on thinking about the business in terms of customer needs and their satisfaction. 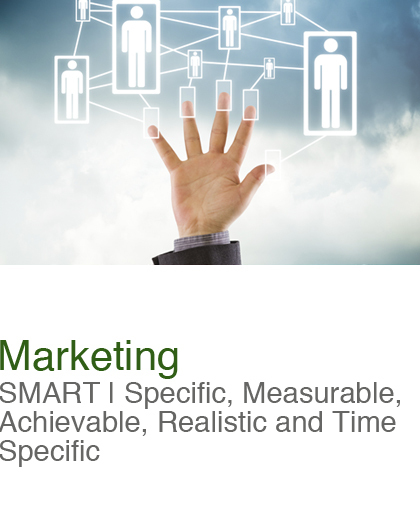 By working through your target market and segment data, we come up with marketing objectives that fit your needs. Our SMART approach allows us to effectively manage your marketing activities and allows you to determine how successful they have been and whether they have delivered the particular benefits sought. We understand your marketing objectives by analyzing your strengths and weaknesses, and the business environment you operate in. We then link them to your overall business strategy. Build Meaningful Relationships: Make you accessible and approachable to a mass audience whether you are a big brand or a sole proprietor. Manage Public Relations and Brand Awareness: Spread news and important information about your business, brand, product or service to a broad audience who are likely to share it to its own networks. Build Customer Loyalty: Give consumers a reason to interact with you by offering promotions, coupons, or information. Establish Trust: Share valuable information with your network that shows you are knowledgeable in your field and people will seek more information from you. Manage Your Reputation: Hear what people are saying about you and your business and let people know that they’re being heard. Increase Search Visibility: Manage your activity in social media to enhance your visibility in major search engines.